Investing in a Philips Airfryer has probably been my best investment in (late) 2015, because it has been a great help in my journey towards cleaner and healthier eating in order to watch (hopefully drop) my weight lately. I posted about airfried zucchini & carrot balls previously which look like a healthier version of the cream puff, is chock-full of nutrients and happens to taste deceivingly like Popeyes' honey biscuits which I adore. If you haven't already seen the recipe for it, head over here to read about how you can make your own! Today I went browsing at Cold Storage after my tuition got unexpectedly cancelled, and chanced across Portobello Mushrooms for sale at 50% off their original price. The catch was that they needed to be consumed within the next 2 days, so I grabbed a pack and headed to the counter. 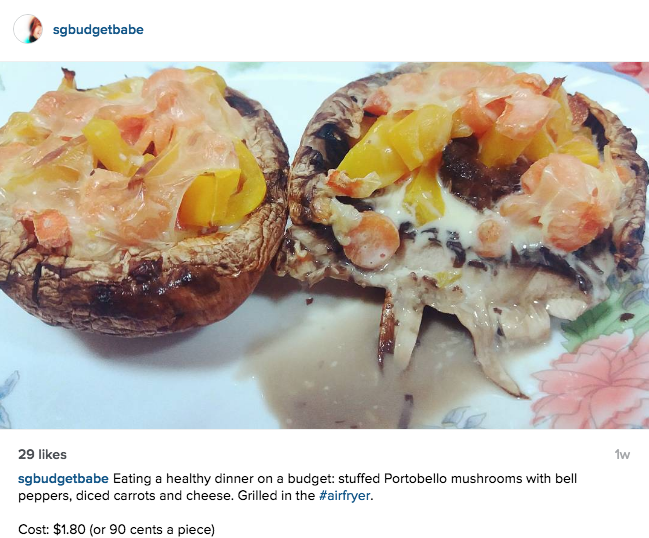 Follow me on Instagram for more snippets of my budget eats and finds! Made my own stuffed portobello mushrooms by improvising on the recipe below. I honestly just meddled with whatever ingredients I had in the fridge but they came out pretty good, don't you think? 1. Wash and dice all the vegetables (except mushrooms). 2. Mix well in a bowl with a sprinkle of black pepper. 3. 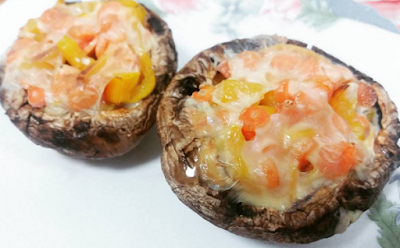 Make a couple of cuts on the mushrooms without slicing them completely. Stuff the mixed vegetables on top of each mushroom. 4. Layer cheese over the stuffed mushrooms. 5.. Place in preheated Airfryer at 180 degrees for 8 minutes. The photos above are a little less colourful as I only had yellow bell peppers to experiment with, but do try them with all 3 versions for extra kick and nutrients! If you want a little more protein in the mix, you can also add in diced ham, minced beef or even tuna into the stuffing and play around with the flavours. Warning: The mushrooms will ooze juicy goodness out when you cut it, so you can pair it with rice or a wrap if you want a little more carbohydrates in your meal as well! Do you have any other healthy airfryer vegetarian recipes to share? I would love to hear from you! Really its so good. I cook to follow your tips. It was so tasty my husband (vegitorian) like this. He want to eat it again. I am so happy. I need more recipe tips, have you another air fryer blog site?